What, really? That common, can-be-ugly plant? Well, yes! What other tough, durable shrub will bloom from very early spring till frost? The flowers can nearly cover the plants all summer, with minimal attention, reliably from year to year. If they get too unruly, they can be pruned back to nearly the ground, although a light and regular shearing in winter would provide more flowers the following season. Potentilla fruticosa is native to North America, in a wide range of habitats from very dry to very wet. They prefer a moist, well-drained soil, but will do just fine in clay, rocky, alkaline, and poor, dry soils. Although tolerant of dry summers, they will look much nicer with regular watering. They really need full sun and not too much shade. They have a multitude of purposes in the landscape as well: as a low informal hedge, in a shrub border, as foundation plants, or even as a groundcover. At Blue Heron Farm, we are currently growing nine selections. Here are two we recently started growing. 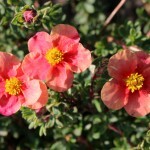 Potentilla fruticosa 'Setting Sun' is a small, compact shrub with peach colored flowers that have a dark peach-red eye. As the flowers age, they can pale, creating many tones of peach, pink, and yellow in a setting sun effect. The flowers appear late spring through fall. The foliage is a dense gray-green. Adapts to poor, dry soils. Prune as needed to maintain a tidy form. 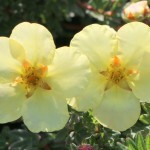 Potentilla fruticosa 'Summer Dawn' is a compact, upright shrub with single yellow flowers that are slightly darker in the center. The large flowers appear late spring through fall. The foliage is a dense gray-green. It adapts well to poor, dry soils. Prune as need to maintain the desired form.